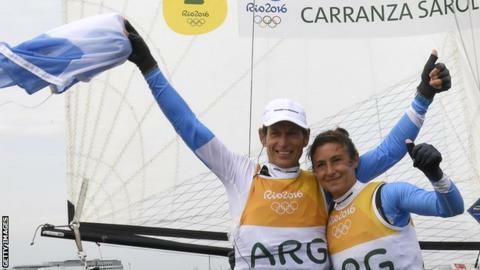 Argentine sailor Santiago Lange, who lost part of a lung to cancer last year, teamed up with Cecilia Carranza Saroli to win gold at the Olympics. The 54-year-old, the oldest sailor competing in Rio, and his compatriot won the Nacra 17 mixed category. Lange was diagnosed with cancer in 2015 and believes he owes his early diagnosis to the sport. "Probably if I wasn't travelling so much and wasn't so tired it wouldn't have been found," he said. "I was very lucky to find it. "My philosophy and what I learned through the sport helped me a lot. With sailing you learn to suffer in a certain way, to go through hard times and stand up and keep pushing." Lange teamed up with Carlos Espinola to win Olympic bronze in the Tornado in 2004 and 2008. His sons Yago and Klaus will compete in the 49er skiff class in Rio. Australia were second behind Lange and Saroli, with Austria third. British pair Ben Saxton and Nicola Groves finished ninth in the medal race, and ninth overall. Find out about how to get into sailing with our special guide.